Michael “Spence” Spencer has more punch lines than he knows what to do with. He is a traveling comedian who has yet to hit the big time, since being on The Late Late Show eight years ago! Tired of low-budget and ungrateful comedy clubs, Spence considers throwing in the towel when he meets Sam. She makes him a better comic, but she doesn’t want to constantly hear Spence give a “performance." Spence faces the decision of a lifetime: the girl of his dreams or the comedy career that will make him famous. Ward Anderson delivers the final laugh in I’ll Be Here All Week. Falling in love is like stand-up comedy. You have to be crazy to do it. . .
Spence is a stand-up comedian whose claim to fame is a one-time appearance on The Late Late Show. Eight years ago. Since then, he's been living on the road, working in clubs like The Comedy Crib or The Funny Farm or The Laff Shack--if he's lucky. More often than not, his agent lands him gigs in country western bars. On a good night, he gets free drinks; on a bad night, he offends the audience with dirty jokes. Spence's ex-wife thinks he should find a nice girl and settle down. His ex-wife's husband thinks he should stop having his mail sent to their house. What does Spence think? That trying to have a relationship on the road is no laughing matter. Especially when he meets Sam. . .
She's smart, she's beautiful, and she's Canadian--but she's not putting up with his schtick. Sam wants Spence to drop the jokes and be himself, which is hard for a man who's funny for a living. But the closer they get, the more successful Spence becomes. Can a stand-up comic live happily ever after with the girl of his dreams. . .without it ending in a punchline? Ward Anderson is a comedian, author, and radio host who has toured and performed all over the world. 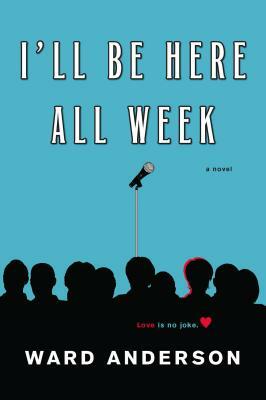 His debut novel was I'll Be Here All Week. He has won awards for his work directing TV commercials and music videos. Currently, Anderson is a co-host on the radio talk show "Ward and Al," which airs weekdays on SiriusXM satellite radio. He lives with his wife in Toronto, Canada. Visit him at wardanderson.net.